Welcome to Unshelved, the world's only daily comic strip set in a public library! 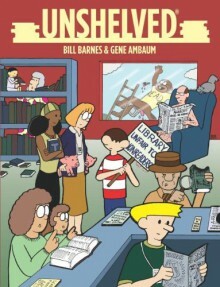 Writer Gene Ambaum (the made-up name of a real-life librarian) and co-writer and artist Bill Barnes have been publishing since February 16, 2002. Some of the stories are made up, some of them are based on real life, and some are absolutely true stories sent to us from our readers. And the stranger the story, the more likely it is to be true. I certainly think this is a much better book than the later one I read. I didn't find myself laughing out loud, but the strips were interesting. Would recommend to people who love libraries!